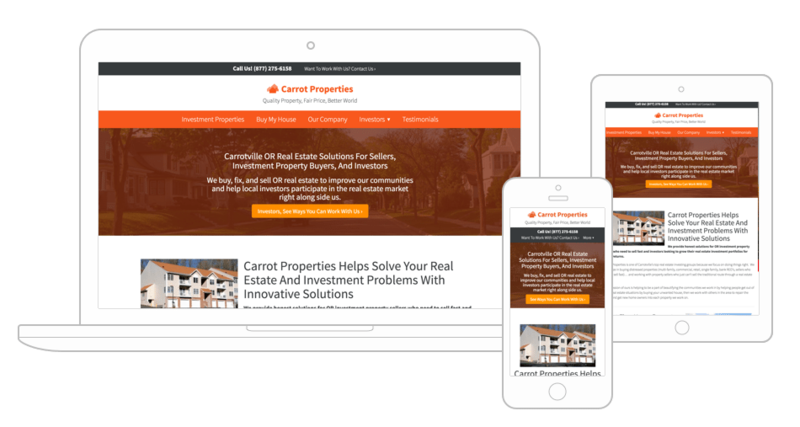 Learn how InvestorCarrot websites can help build credibility for your brand. One of the most overlooked websites by real estate wholesalers and flippers is what we call a “main company” credibility website. The website that is your “online home”. Where business partners can learn more about you. Lenders and investors can see what you do and you can earn their trust. A place to post your wins as a company and educate your partners and clients. See how our Main Company Credibility websites can help you create that online home that not only helps you build your credibility more easily, but also has our built in lead generation and SEO tools that makes your main website not just a pretty site… but also a lead generation tool at the same time. Our data shows that a significant amount of your prospects (house / land / note sellers, buyers, tenants, etc) hit Google to research you before they do business with you. What do they see when they look you up online? Well that’s what our Main Company websites help you control.